This is a guide on editing filenames and making them 508 compliant. 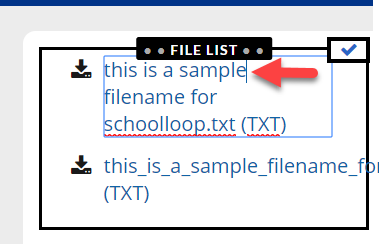 File names may be edited in the module. Click anywhere on the file name and you will see an I-beam cursor indicating that you may edit the name. If the name of a file is extending outside the module border, it may be that the name is long and without spaces. For 508 accessibility, file display name should not be the same as you might use when storing files on your computer and should not use file extensions. Put spaces in between words to wrap them inside the module. For 508 accessibility example: Use Field Trip Permission Form rather than field_trip_form.pdf.